Planning for a summer picnic? Looking for picnic recipes or ideas? 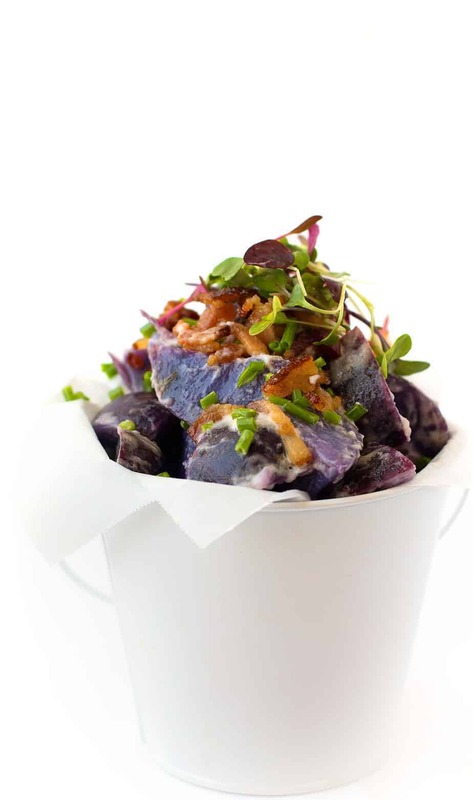 If you need a picnic food recipe that is easy to make and easy to make, check out this purple potato salad recipe with bacon and chive! I love bringing potato salad to enjoy outside because it is equally good served hot or cold. They work well as a side but with the bacon in there they can work as a main dish, too. The purple potatoes are gorgeous, I actually bought 2 bags of mixed potatoes (white, red and purple) but opted to use just the purple ones for this recipe. Potato salad is a great picnic food! With 4th of July around the corner and prime picnic weather in full swing I hope that you’ll be making the most and getting out to enjoy the outdoors, good friends and tasty food. I am a realist and know that during picnic season I’ll likely be eating a lot of sweets, they are especially hard for me to turn down at gatherings. For my potato salad I used SPLENDA® Sugar Blend, with less sugar added and great flavor it lightens up the recipe perfectly. When swapping sugar for SPLENDA® Sweetener Products in your own recipes, please refer to the SPLENDA® Brand measurement conversion charts. 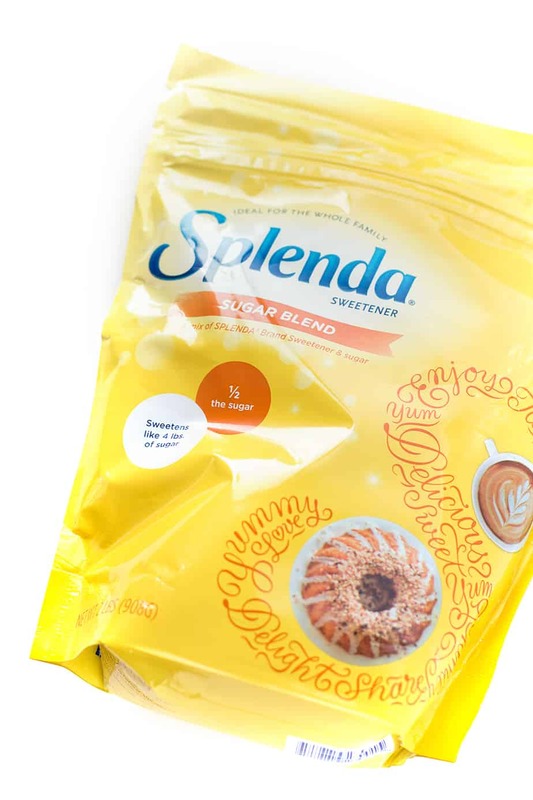 Just a half-cup of SPLENDA® Sugar Blend replaces a full cup of sugar. If you have been looking for the ideal red skinned potato salad and I think you found a great alternative. I hope you enjoy this purple potato salad recipe. My Man Loves to Sneak My Skinny Cow! Yum – purple potatoes are so pretty and tasty. I always use Splenda instead of sugar and I’d love to try your recipe. It’s so colorful and I know my family would love it. I have never heard of purple potato salad before!! This look really good, love that you used Splenda instead of sugar! Until about a year ago I didn’t even know there were such things as purple potatoes. My husband’s favorite colors so I should make him something like this just because of the color. This looks delicious. I love potato salad!! It is my favorite side dish for a bbq, I have never had purple potato salad though looks really good! This looks so good. I love a good potato salad and I like trying new recipes for it. This sounds really delicious. I can’t say that I’ve ever seen purple potatoes but I’m going to look now so I can try this recipe. This looks like such a delicious potato salad. 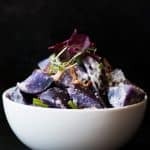 I love purple potatoes so I can’t wait to try this recipe. This would be perfect for the Fourth of July! I have seen purple potatoes floating around a lot on Pinterest and other blogs. This potato salad looks amazing! This sounds like an interesting recipe for potato salad. 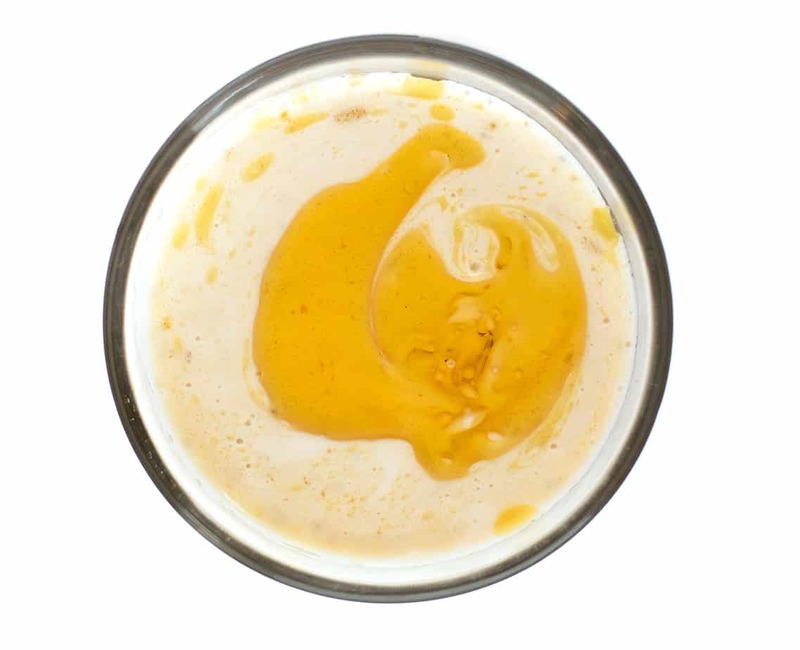 It would probably be a great recipe to try for the 4th this weekend. Thanks for sharing the recipe. This looks so good! I really want to try it out. It definitely seems like a recipe that would impress guests. 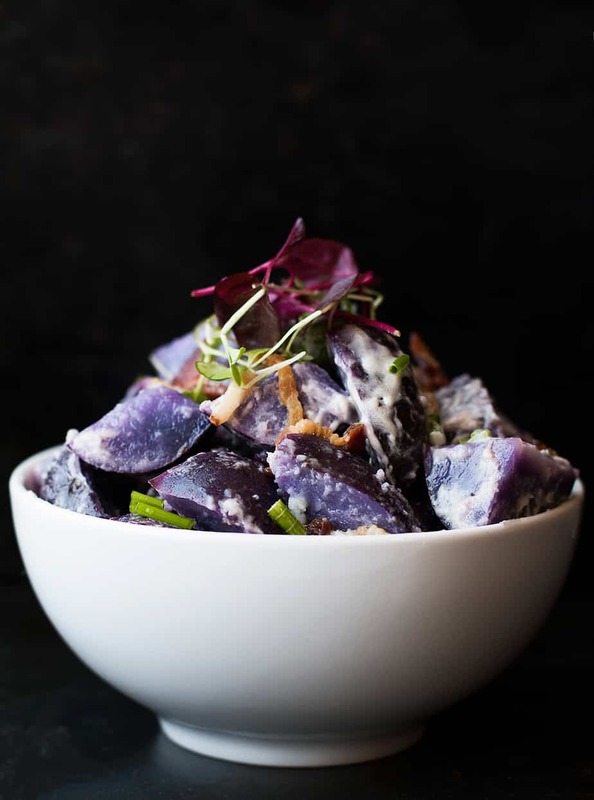 I have never tried purple potatoes before, but I love this dish! Bacon and chive are such complimentary flavors. This is something my husband and kids would love! I think it looks pretty delicious, but I am not sure I would be able to do it until my baby is born! It looks so good though! Purple potatoes looks much healthier than regular ones. This combination looks delicious especially with the healthy splenda in it. 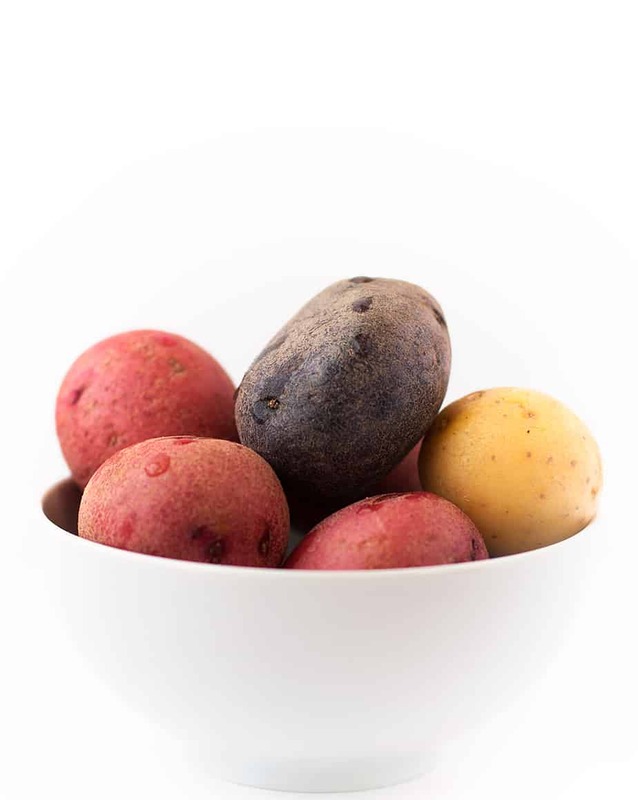 I love purple potatoes – they just look so beautiful! I have never tried them cold in a salad before, I can’t wait! I have never heard of this type of potato salad before but it looks so good. I will have to take a look for purple potatoes! Purple is one of my faves anyways. Now in potato salad? Yes please! !